With back pain, or any pain in your joints. muscles or tendons, save yourself a lot of time and money: try Scenar. 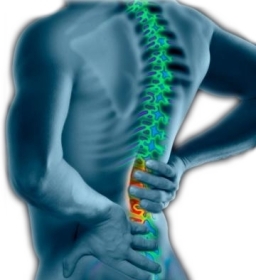 It is simply one of the best back pain and musculo-skeletal treatments available. Scenar is based on similar principles to acupuncture and other zonal therapies, and is at least as effective in treating back pain. I have treated acupuncturists and osteopaths who have told me that Scenar gave them more relief for their own back pain than anything else. In additon to releasing cascades of natural pain-killing peptides, part of the Scenar process is that it helps to relax, re-educate and re-align muscles, ligaments and trapped nerves. Helping the body to make its own adjustments is the very essence of the best back pain treatments available, and is key to lasting results. This section is not designed to help you diagnose your own condition. You need to see a doctor for that. [Please note that some back pain, particularly in the upper part of the back, can be due to more serious causes such as cardiovascular problems, so make sure you see your doctor for a diagnosis]. Rather, it is meant to help you understand the range of factors that may be involved and to give you some ideas on how to support the Scenar treatment and prevent further recurrences. Heavy lifting or carrying: one of the most serious causes of back pain in that this is more likely than most other factors to cause real damage to soft tissues or even the spine. It can affect any part of the back but especially the lumbar region. Prolongued poor posture: slouching in a chair, driving for a long time without a break, standing up for long periods sets up a temporary misalignment in muscles. Over-stretching: twisting, bending, reaching, stretching awkwardly sets up a temporary (but may become chronic) misalignment in muscles. Respiratory conditions: violent coughing causes spasms in the back muscles, which can become temporarily misaligned. (It is particularly important with thoracic back pain linked to chest discomfort to get a doctor's diagnosis). Major injuries: falls, car crashes, contact or extreme sports injuries and industrial accidents can all cause major back problems. Scenar can help in most situations, but how it helps depends on the severity of the damage, which may first necessitate orthopedic medical interventions. Acute back pain is usually the easiest type to treat, and, depending on whether any long-term damage has been done, just one or two Scenar treatments are sometimes sufficient to give major relief. Any of the above factors can be involved, but the back is such a complex collection of bones, joints, muscles, tendons, ligaments and nerves that it's notoriously difficult to pin down the causes in any one case. So this is just an explanation of some of the most common factors, and of how Scenar treatment may help. Every bone, joint and tendon in the body is connected to all the others through the fascial network surrounding them, and via the propriocetive nerve impulses connecting all of them to the brain. The root cause of most back pain -- muscle tension and mis-alignment -- appears to build up from a collection of inter-locking factors, different in each person: old injuries, years of poor posture, the angle the feet meet the ground, incorrect spinal curvature, being overweight, pregnancy, driving for long periods, bad and insufficient sleep, poor bed mattresses, respiratory conditions, bad workplace ergonomics, and the type of work. These causes can be massively worsened by a cycle of emotional stress, in which the stress and back pain reinforce each other. Too many signals, resulting in a tight, shortened muscle. No amount of stretching exercises will keep it elongated because the excess nerve messages will send the muscle back to its shortened state. To treat this cause of back pain requires loosening and elongating the muscle. Or not enough signals, resulting in a weak, lengthened muscle. Again, the continuing impulses from the brain ensure that no amount of resistance exercise will help the muscle to regain its normal strength. This type of back pain requires tightening and tonifying the muscle. When one side has been injured or gone weak, the same muscles on the other side will try to compensate, resulting in further scrambling of the messages to and from the brain. Some acute back pain may already be felt. This process undermines the overall integrity of the body's kinetic chain, as chronic weak links appear. A problem in your lower back may cause a problem in your hips or your knees. Now what started as fairly routine back pain is complicated by referred pain and described as sciatica or radiculopathy. Scenar's approach is often known as "muscle re-education": re-setting the signals between the brain and the muscles, which then generates more balance between the two sides of the body, and between different limbs or sections of the body. As these nerve signals are normalised, it encourages the body to restore balance in the strength and length of the muscles, and to reduce inflammation and pain. Without some kind of intervention that re-sets the malfunctioning neurology, any amount of kneading, twisting, and manipulation is unlikely to do much more than temporarily alleviate the back pain and restore limited function, without addressing the real, underlying causes of the problem. Lumbar, or lower back pain is especially common, and debilitating, since this area of spine and muscles is needed for almost all activities, and is especially prone to lifting injuries. Among various causes are slipped discs, sacroiliac and hip mis-alignment, and pulled muscles. One in three adults in the U.K. suffers from back pain, and about 2.6 million visits are made to GP's every year for treatment. It is estimated to cost the National Health Service £1.5 billion per year. A 2013 report by the U.K.'s Work Foundation think-tank found that the British now take 15 million days off per year due to back pain, the second worst in Europe after Germany. It forecast that many EU states will see half the population diagnosed wth back pain by 2030. It further suggested that absence-from-work rates across Europe could be greatly cut if early intervention became the norm, which would greatly increase productivity and therefore economic growth. Unfortunately, it said, doctors are not taking back pain seriously enough due it not being life threatening. Another recent survey by market research company ICM found that 98% of manual workers have struggled into work while suffering with back pain. More than half of all workers in plumbing, carpentry and other building trades said they forced themselves to keep working due to worries about losing jobs or income, and nearly half did not tell their boss or colleagues. Another recent report by the UK's National Institute for Health and Clinical Excellence (NICE) said that 9 to 10 acupuncture or chiropractic sessions was the most effective remedy for chronic lower back pain. Scenar is at least as effective, but would have been too unfamiliar for them to recommend. NICE also said doctors should refrain from referring back pain patients for X-rays, ultrasound and MRI scans, unless absolutely necessary. Many of the people I've helped with Scenar for simple neck pain and back ache have seen a complete removal of pain in just a few sessions. I've also had excellent results, using a full course of treatments, with more chronic forms of back pain such as herniated discs and the referred pain of sciatica and radiculopathy. 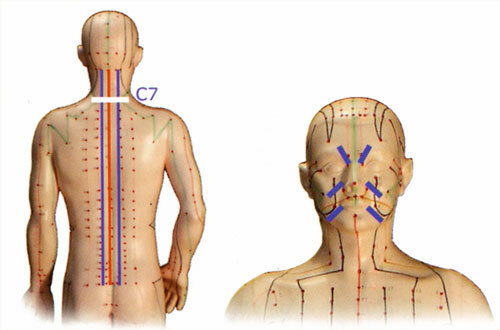 In most courses of Scenar therapy, whatever the condition, treating the back is central to everything, especially the "Three Pathways and Six Points protocol" shown above. This gives us readings from the entire central nervous system, and through the back, we give what amounts to a whole-body MOT and tune-up. Although the objective is wider than just the back, this general treatment is often enough on its own to remove simple back pain in just a few treatments. Some back pain just goes away temporarily without treatment, but the factors that created it usually don't. If it's left until strong drugs and surgery are prescribed, the condition is already moving towards becoming a very chronic problem, or even disability. If you have recurring or continuous back pain, it makes a lot of sense to deal with it now.